Four of my favorite percussionists, masters in their respective disciplines, come together for a highly-charged musical exchange; explosive, unpredictable, and unusual. 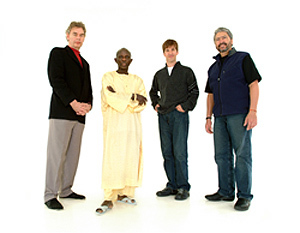 Doudou N’Diaye Rose (Senagalese master of the sabar ), Chad Wackerman, (Frank Zappa, Allan Holdsworth), Luis Conte (Madonna, Michael Jackson), and Bill Bruford (Yes, King Crimson, Earthworks), are known internationally as the World Drummers Ensemble. For those unfamiliar with, or unpersuaded by, the astonishing and increasing grip of the percussive arts as an innovative force in music across continents, this new Dual Disc CD/DVD, “A Coat of Many Colors”, offers conclusive proof, were any needed, that rhythm beats at the heart of all things. I’ve worked with both Bill Bruford and Luis Conte, and I’ve seen the work of both Chad Wackerman with Frank Zappa, and Doudou N’Diaye Rose with Youssou N’Dour, so my anticipation of this new release has been extreme to say the least. A true cultural ambassador for Senegal, Doudou N’Diaye Rose is today considered as one of the great musicians of his time. Chief drum major, founder of the Drummers of West Africa, he is the most famous griot in Sengal. Both guardian of the tradition and untiring innovator, this virtuoso of percussion is now perceived as a true conductor, the African equivalent of a great conductor of a symphony orchestras, regularly leading groups of from 20 to 100 drummers. As part of the World Drummers Ensemble he has immersed himself in less familiar ideas of odd-metered rock, jazz improvisation and small group interplay. Born 1928 into a griot family, he soon rose from the shadow of traditional drum major to become the rising darling of the Senegalese drumming community. With Independence in 1960 he joined the Senegalese National Ballet, propelling him to international stardom. For many years his ensembles of varying sizes have toured world capitals to huge acclaim. In 1996 he was the center of attention at the opening of the National Black Arts Festival in Atlanta, Georgia, and he has invented more than 500 new rhythms in African percussion. Chad Wackerman’s drumming combines the power and conviction of rock with the sensitivity and finesse of jazz. His playing is remarkably free of predictable patterns and licks, relying instead on invention and interplay with the musicians around him Phenomenally skilled, he has amassed a remarkable body of work including a seven year association with Frank Zappa, with whom he toured and recorded 26 albums including the London Symphony recordings. He has also recorded and /or toured with, among others, Allan Holdsworth, Barbra Streisand, Steve Vai, Andy Summers, Men At Work, Albert Lee, James Taylor, John Patitucci , Joe Sample, and most recently with another ex -Zappa drummer , Terry Bozzio. As a band leader and composer Chad has four critically acclaimed CDs titled ‘Forty Reasons’, ‘The View’, ‘Scream’, and his latest release ‘Legs Eleven’. Grammy-winner Luis Conte is an acknowledged master of Afro-Cuban percussion. His celebrated career includes working with some of the greatest names in contemporary music, including Madonna, Eric Clapton, Phil Collins, Santana, Jackson Browne, Celine Dion, Barbara Streisand, Ray Charles, Tony Bennett, James Taylor, Shakira, Ozzy Osborne, Queen Latifah and Cuban legends Arturo Sandoval and Cachao. He can also be heard on the scores and/or soundtracks to such box office smashes as Mission Impossible, Rain Man, Waiting To Exhale, Coming To America, and countless others. His percussion clinic tours take him around the world teaching musicians the essentials and history of Afro-Cuban rhythm, and he has recently just released his signature line of congas, timbales and shakers for the Meinl Company. By the tender age of 27, Bill Bruford’s musical character had already been forged in the fiery furnace of four of the biggest progressive rock groups of all time; Yes, King Crimson, Genesis, and UK. Early success propelled Bill, by nature a restless innovator uncomfortable with the well-worn path, into a fascinating 30 year career as a band leader and writer. Groups such as Bruford and Earthworks led the way with advanced harmony in electric rock in the 70s & 80s; samples, electronics, and odd-metres in electric jazz in the 90s; and stylistic innovation with strong compositional identity in his current acoustic jazz. His taste for the unpredictable in live performance has led him to collaborations with countless of the world’s top musicians, not least the World Drummer’s Ensemble, in an endless search for the innovative, the unusual, and the unlikely. 30 years after Progressive rock, Bruford remains a vital force in all things percussive, and his life’s work is well documented on CD and DVD at Summerfold and Winterfold Records. The music includes pieces from all members, but also from Switzerland via Pierre Favre, Turkey via the Harem Percussion Group, America via Max Roach, and there’s even a re-working of King Crimson’s “B’Boom”. This Dual Disc CD/DVD documents over an hour of their ambitious programme from concerts in Amsterdam and Brussels, and includes a complimentary 15 minute DVD on the reverse side. Like Mickey Hart’s Planet Drum, and other modern percussion ensembles, the “World Drummers Ensemble” is a fascinating blend of cultures that was until now, only dreamt about being performed. The pyrotechnical abilities of Wackerman, the smooth and tasty latin rhythms of Conte, the old world Senegalese flavor of Rose, and the jazzy stylings of Bruford, make this album one that will be talked about for years to come, and I hope, the beginning of many more such musical excursions.